"Dale Coyne Racing with Vasser-Sullivan". That's takin' alot of owners to get Bourdais' car to the style he is accustomed to. Meanwhile Marco is off to Andretti-Herta with a new number. Interesting to see Wickens on the grid and to see a Fittipaldi scrollin' by on the timing ribbon once again. I note Ed Jones with a plumb Ganassi drive alongside Dixon. Nice to see Michael Shank represented there. .
...Racer.com is predicting at least one bump car now. I think this is awesome. I'd like to see even a few more. I don't think Daly is quite in at Coyne yet. He's listed as one of Coyne's drivers in that racer article. Conor Daly is thought to be in line for Dale Coyne's fourth seat. Daly lost his ride with A.J. Foyt at the end of last year and has been scrambling to come up with sponsorship so he can reunite with Coyne, whom he drove for in 2016 [below]. "Nothing to report yet, but I'm working on it," he said this week. Fair enough but strange they listed him. Danica to race with #13 on the car. It's been confirmed, Daly gets the drive with Coyne. It keeps looking more and more like there will be Bump Day action, ok maybe only 1 or 2 guys getting bumped but still how many years since we've seen a real bump day? IMSA team Scuderia Corsa to enter the 2018 Indianapolis 500, with Oriol Servia in collaboration with Rahal Letterman Lanigan Racing. "IndyCar expects 'bumping' to return at the 2018 Indianapolis 500 as a 35-car entry list looks likely." Yet there are already 19 Honda-powered entries confirmed. If Chevrolet can supply 17, that gives us up to 36 entries. Pippa Mann will race with Dale Coyne Racing making her sixth appearance in the 500 and making this Dale Coyne Racing's fourth entry. 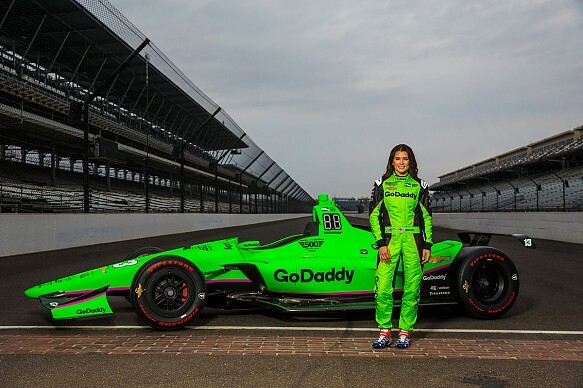 This is the one we have all been waiting for, the Danica Patrick GoDaddy liveried car.